Pierre-François Ouellette art contemporain is pleased to present its first collaboration with Mark Clintberg: Vitrine, a solo exhibition of new works including sculptures, monoprints and video. Vitrine features a suite of works that address expressions of affection and protection in close, intimate relationships by drawing on the western museological tradition of glass display cases. Mark Clintberg was born in Edmonton. He lives and works in Montreal. As an artist, critic, art historian and curator, he often reveals the fluidity between private and public, intellect and emotion, interior and exterior. He earned his Ph.D. in Art History at Concordia University in 2013, where he is an Assistant Professor, LTA. His work has recently been shown at the Dunlop Art Gallery (Regina), the Art Gallery of Nova Scotia (Halifax), the Art Gallery of Alberta (Edmonton), the Illingworth Kerr Gallery (Calgary), AXE NÉO-7 (Gatineau), and Trapdoor Artist Run Centre (Lethbridge). Other exhibitions featuring his work have taken place at Locust Projects (Miami), the National Gallery of Canada (Ottawa), the Banff Centre, Centre des arts actuels Skol (Montreal) and Eastern Edge (St. John’s). He was shortlisted for the 2013 Sobey Art Award for the region Prairies and the North. Public and private collections across Canada and in the United States including the National Gallery of Canada and the Alberta Foundation for the Arts have acquired his work. Please visit the gallery website for more information. 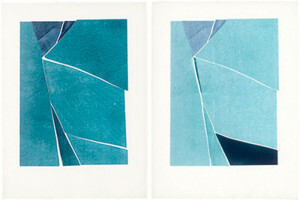 Marck Clintberg, Pudenda 1-2, 2014, monoprint on Somerset paper, 61 x 46 cm (24″ x 18″) ea.